The focus of this outfit was the pink, white and brown statement necklace. In order to keep the focus on the necklace, I put the outfit together with very simple, neutral pieces. Like, the white shirt; but the white shirt was crocheted lace, so while the color was neutral, the fabric added some interest. My white, lace, scalloped shirt is J. Crew. 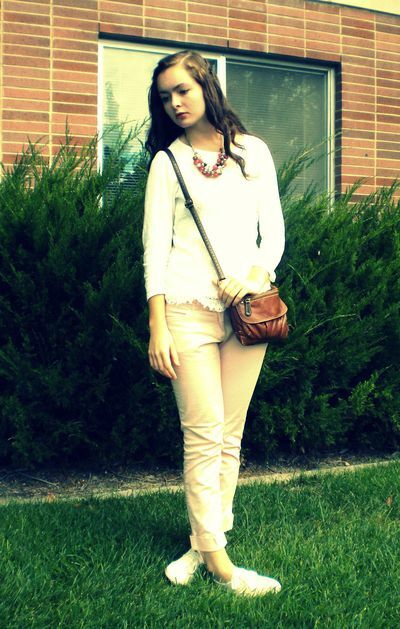 My blush pink, cropped pants are from New York and Company. My white sneakers are Keds. My necklace is from New York and Company. My bag is Bueno.